While, the economy has an impact on the style and fashion of the weddings of the season, it is also important to keep in mind that couples are becoming more creative in their wedding choices and wholesale dress vendors should capitalize on the latest trends. Mismatched bridesmaid dresses continued to flourish this year as women were encouraged to choose dress cuts that flattered their particular body types. The latest trend in 2010 was for brides to give their bridesmaids to not only choose their styles, but to also choose their designers. While, the colors of the dresses remain the same, the styles can vary tremendously. For several years now, strapless dresses have become very popular. Many guests are opting for sleeves, straps, and other methods for covering their shoulders, but the strapless special occasion dress phenomenon will be here to stay for the immediate future. 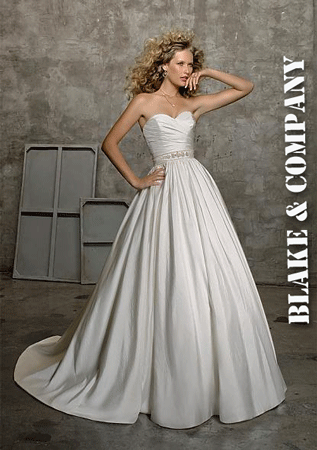 Blake and Company’s New York Wholesale Dress showroom has plenty of amazing deals on beautiful wholesale dresses! Come and see our mother of the bride and mother of the groom dress collections for yourself! Celebrities must own a slew special occasion dresses and their dress repertoire needs to be ready to take on the challenges of a night out on the red carpet at a moment’s notice! And heaven forbid they wear the same gown twice! However, the rest of us mortals still need to look our best whether we are attending a bar mitzvah, a wedding, a special occasion or preparing for an elegant night on the town! But just how much are women willing to spend? The wholesale dress industry has it figured out and they know how much a women is willing to spend on special occasion dresses. There is even a nickname for the price range – it’s called the “sweet spot”. The “sweet spot” refers to the price between $300 and $800 for special occasion dresses. This is the point at which style meets budget. Retailers want to keep the cost of special occasion dresses below $500. While A-List celebrities may have no problem shelling out $3000 for an evening gown, the average special occasion dress consumer is more likely to spend $500. The $300 – $800 price range is where special occasion dress businesses make their money. It is important to keep this in mind when purchasing wholesale mother of the bride dresses. Blake and Company is the place to find wholesale mother of the bride dresses. Blake and Company’s New York Wholesale Dress showroom has plenty of great deals on beautiful dresses in the “sweet spot” price range. Come and see our collections of Daymor, Damianou, Ideas by Barbara, SIA SIA, Scaravelli, J.S.S. Knitwear, Ann Balon and VM by Mori Lee. Come and see our Mother of the Bride and Mother of the Groom dress collections for yourself!